The entrance of your home is a critical area to design well because as we all know, first impressions count. As the first thing that visitors will see when they arrive, your entrance is your opportunity to offer guests a warm welcome while introducing the personality of your home. Equally important, it welcomes you home every day, so make it somewhere that you’re glad to come home to. The entrance to your home begins the moment you get to the front door, so make sure both inside and out get the attention of your decorator’s touch. Make your foyer the best possible introduction to the rest of the house, and if you wish, you can have a bit of fun with the doorway; paint, tiles, door handles and lighting are all ways to make front doors a statement – a dramatic entrance, if you will. What front doors can I choose from? Your first decision when updating front doors is what type of external doors you want to use, taking into account style, security and accessibility. Investing in a high quality front door is always worthwhile – this is a purchase where a little extra money goes a long way. Hardwood exterior doors remain the most popular choice of front door; as well as being the most economical, timber also opens the door to an endless selection of paint, hardware and embellishment. However, natural wood doors do have their downsides – prone to warping, they require more upkeep and may require replacing if not adequately cared for. Whether you opt for solid oak external doors or an oak veneer option, wooden doors are a match made in heaven for period architecture – it’s hard to imagine a Georgian house without a solid, six-panel door, or a Victorian home sans its gleaming hardware and stained glass panes. If you prefer non-wooden exterior doors, the alternatives are UPVC doors, GRP doors (collectively known as composite doors) and steel doors. UPVC front doors are often the most inexpensive alternative to timber and offer added insulation benefits; because the material itself can be a comparatively insubstantial, UPVC external doors are built into steel door frames for added reinforcement. GRP (glass-reinforced plastic, or fibreglass to you and me) doors offer the same properties, with a woodgrain effect that can provide a happy medium for lovers of timber. Steel doors are less widely used in the UK than the US, and make great contemporary front doors thanks to their sleek, modern appearance. How do I decorate my doorway? Renovating or replacing your front doors is one of the quickest ways to give your home a makeover, and affords the perfect opportunity to add a splash of colour to the front of your home. 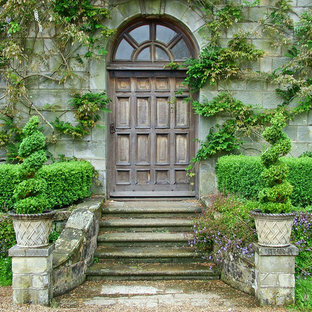 To improve your front door’s kerb appeal you can flank the doorway with decorative trees or flowering plants in attractive planters and “dress” the door with shiny hardware. Door knockers and door knobs can be more than functional with a range of styles and materials available to add some personality to exterior doors. A traditional brass door knocker can be the perfect complement to a solid oak doorway painted in a rich shade of green or blue, whilst contemporary chrome door hardware will look perfect against a white or eggshell door. If you are looking for an elegant front door option, opt for a hardwood door with built in obscured glass panels to let light into your hallway. If you would rather avoid a glass paned front door for security reasons then smaller decorative glass panels can also be inserted into the surround or door frame. You can choose stained glass panes for decorative effect, patterned or textured glass will allow light in but protect your privacy or get your home name or number etched into a glass pane for a practical but personal touch. How should I light my front entrance? The warm glow from a doorway is one of the most welcoming sights that can greet us when we arrive home. An entrance light is of practical importance – we have all spent time fumbling for our house keys in the dark – but it also offers an opportunity to add warmth and character to front doors and entrances. A wall mounted lantern is a charming traditional choice, or for bright, directed illumination opt for a security spotlight. There are a whole variety of switching options available – you can choose a motion sensor light that switches on right when you need it most, a timer light that will offer illumination on a fixed schedule or a switched outdoor light. Pointing light upward is a good way to avoid harsh glare, or choose recessed lighting if you prefer not to have a hanging light in front of your external doors. An entrance is also a great place to display lighting as a decorative feature – choose a table lamp that echoes the lines and colours of the hall beyond it. What furniture and storage do I need in my entryway? It’s important to keep the entrance to your home as open and clutter free as possible, so selecting a few practical items that will help with storage and offer a warm welcome is the best approach for this area. 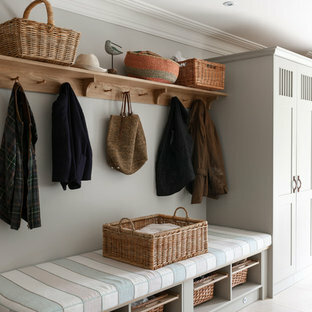 Coat stands, umbrella holders and shoe racks are practical foyer additions that will keep the area tidy. For the knick knacks and paraphernalia that so often accumulate by front doors, sideboards or console tables are helpful and opting for a something with a drawer is a clever trick to ensure these things can be stowed out of sight. If you have the space, an armchair, occasional chair or hallway bench will prove useful for perching on when removing shoes and definitely consider multi-functional furniture such as a storage bench for shoes. A wall mounted shoe cabinet is a must have for a tighter space, getting shoes off the floor and neatly stowed away. How do I decorate my foyer? Particularly in the entrance to the home, colour can be a wonderful tool to set the tone of the house. Neutral palettes can create a serene atmosphere appropriate for greeting guests; alternatively, you might find yourself being a little bit more adventurous by choosing a whimsical wallpaper or a bold wall colour that could look overwhelming anywhere else in the house. 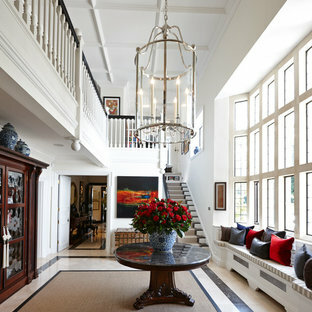 In either case, the foyer can be blended seamlessly into the home with details that connect it to adjoining rooms. Even if your entrance is not self-contained, instead with exterior doors that open straight into the house, visual tricks make it possible to create the illusion of an entryway by defining the space as such. Changes in flooring, a well-placed rug, a screen or curtain, or even furniture such as a console table or coat rack, can be used to delineate the space and distinguish the entrance from the rest of the hallway. Decorating walls and furniture with photographs or artwork is a simple way of bringing your personality into the foyer and plants, lamps, candles, vases and ornaments can be displayed on windowsills, tables or shelves. As a final thoughtful touch, mirrors placed next to front doors are a practical choice for those last minute appearance checks, as long as it’s not directly opposite the doorway, which could back-light the user – decidedly not helpful! 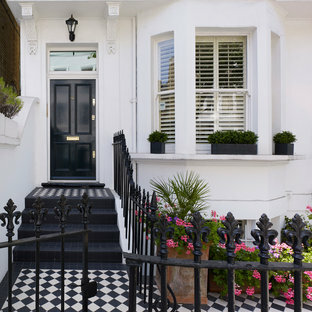 This is an example of a victorian front door in London with white walls, a single front door and a black front door. 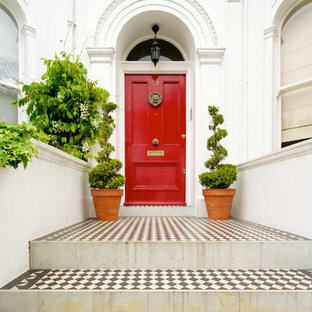 Photo of a classic front door in London with white walls, porcelain flooring, a single front door, a red front door and multi-coloured floors. Inspiration for an expansive traditional front door in Cornwall with a single front door and a dark wood front door. Large traditional entrance in London with white walls. 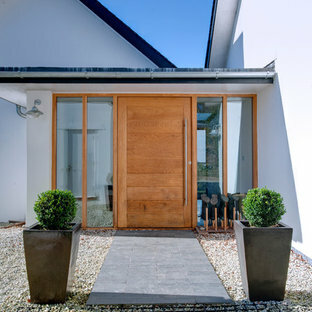 Inspiration for a contemporary front door in Cornwall with a single front door and a medium wood front door. 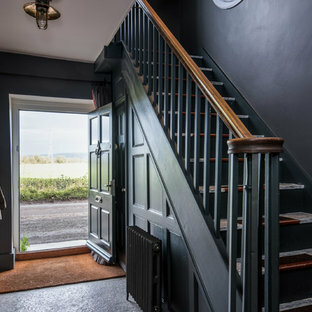 Design ideas for a medium sized traditional hallway in Other with black walls, a single front door and a black front door. 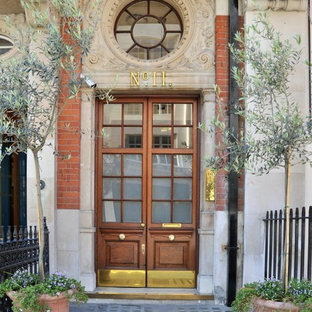 Photo of a classic front door in London with a double front door and a glass front door. 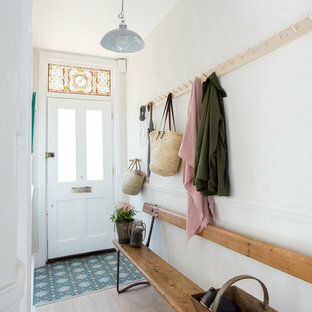 Medium sized victorian hallway in Sussex with white walls, light hardwood flooring, a single front door, a white front door and beige floors. 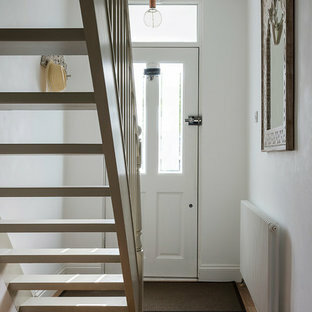 Photo of a classic hallway in London with white walls, medium hardwood flooring, a single front door and a white front door. 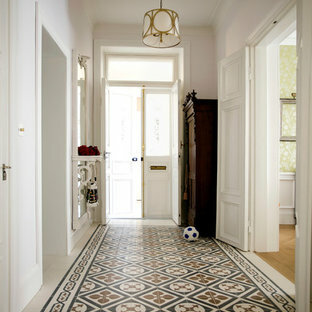 Design ideas for a traditional hallway in West Midlands. This is an example of a victorian boot room in London with white walls and multi-coloured floors. Large traditional front door in London with a single front door and a black front door. In this entrance the doors to the storage were painted in to match the wallpaper. Contemporary boot room in London with a white front door. This is an example of a contemporary entrance in Los Angeles. This is an example of a country boot room in Minneapolis with grey walls, a single front door, a glass front door and black floors. Inspiration for a traditional foyer in San Francisco with white walls, dark hardwood flooring, a single front door, a black front door and brown floors.